One hundred ninety-nine years ago, a man named Alastar rose up against the Holy One, starting the war that would forever change the land of Marlenia. Alastar had a gift that the Marlenians both feared and coveted—he could wield magic. Alastar presented his talents to the Holy One and offered his services in the name of Dashiell, their man-god. In exchange, Alastar asked the Holy One for lower taxes for merchants and other common folk. Back then, the commoners were so poor that some sold their children into slavery just to get their next meal. But the Holy One refused him. Magic was an unholy curse, meant to lead us astray, away from Dashiell’s grace and light, said the Holy One. He rallied the forces of Marlenia to strike Alastar down. But Alastar resisted, and others joined him: our ancestors. While the Holy One wanted Alastar and his magic destroyed, some secretly wanted Alastar’s gifts for themselves. Alastar only entrusted his closest friends with the secrets of magic, and he made these few his apprentices. He taught them how to make objects float in mid-air and how to conjure lightning from the sky, and other spectacular things that you could only imagine. Those who joined Alastar’s cause only to learn his magic did not meet a happy fate. Our ancestors fought for one reason: to be free of the Holy One’s tyranny. Anyone who fought for any other reason was considered an enemy. Thousands from around Marlenia joined Alastar’s cause. And thousands died. Among the dead were the Holy One and his family. With no heir, the throne of Marlenia was ripe for the taking. Just when it looked like Alastar’s men were going to win—just when it looked like everyone would be free of tyranny—another man rose to take the Holy One’s place. Captain Killan Tramore took the sceptre from the Cathedral of Dashiell in the Grand Square and rallied his men. A surprise attack. Even Alastar’s magic couldn’t stop Tramore’s rage—some say he was guided by Dashiell himself. Those who weren’t killed were driven underground. They built tunnels and learned how to survive. But the Marlenians never learned how to use magic. And now, they never would. The flames from the Fighter’s torch danced and threatened to lick the cave walls. Green moss, glowing in the orange light, grew around us. The summer weather meant a warm underground, but it also prevented us from lighting torches on the walls in fear of burning the moss, our one stable food supply. The entrance tunnel was long and narrow, sloping downward, and we walked one by one, manoeuvring around the occasional moss picker. Even if the pickers worked all day and night, the moss wouldn’t feed every Freetor. Nor would we want to eat it constantly: it had a bitter taste and stuck between our teeth. After many twists and turns, we came to an opening in the tunnel. The Great Cavern was the largest cave in all of the underground. Its walls, worn smooth by thousands of Freetor hands, sloped in a concave fashion almost two hundred arm-lengths above me. The tiniest hole at the top let in a speck of sunlight. It shone down in a perfect straight line. A few Freetor merchants showed their wares on matted and mouldy blankets, but the Great Cavern was nowhere near as busy as the Marlenian streets. The poorest of Freetors squatted beneath the line of sunlight, craning their necks to the ceiling, hands clasped in deep prayer. Some of the Freetors believed that the underground was protected by our exiled ancestors. No doubt the words on the praying Freetors’ lips were a plea to those dead and gone. One of the women among them held a crying baby. She sang a song about green hills and children with full tummies, but a melody can’t satisfy a child’s hunger. Their gazes were full of hope, and their nostrils widened with the smell of the bread. One of the hungry Freetors reached for me, as if to ask if I had any food. “You’ll get your share soon enough,” the Fighter said, brushing the hungry Freetor’s hand away. They looked to me and saw my bunched-up violet cape. They knew who I was. I nodded, confirming the Fighter’s words. Meekly, they retracted their dirt-stained hands and returned to their prayers. Rordan and I followed the Fighters through one of the passageways, away from the Great Cavern. We passed by modest Freetor homes, one- or two-roomed caverns. Some had makeshift doors: cloth pinned to the dirt and stone. Some were open, showing the secret lives of my people. Nothing was a secret here. We passed by at least forty-nine; I lost count after that. As we drew closer to the Central Cavern, the dirt on the walls became smooth stone and there were more and more cloths hanging from the walls, not just as doors, but as decoration. One was violet and gold and depicted a hand bursting from the ground, brandishing a spear. There was a story attached to the spear, and I could almost hear my father’s voice whispering it to me, but stories were only words. A spear would be better for the Violet Fox. We stopped before a set of doors, the only wooden doors in the entire underground. The Fighters turned to face us. I couldn’t help by roll my eyes. Great. Now I had to share my glory with my brother. I then felt ashamed at the thought—he had just saved my life. Rordan nodded at the guard. From a pouch on his belts, the Fighter produced a small silver key. I watched, fascinated as it slipped into a hole beneath the protruding door handles. He fiddled with it for a moment, and then there was a loud click. The Fighters each took a handle and pressed down firmly. The doors opened as they strode into the room. It was a magnificent sight. The walls were made of smooth, carved stone like in the Great Cavern, but everything seemed to glow. Even the floors were smooth, and they were decorated in repeating tiles with violet circular patterns. I looked around for torches, but there were none. But the greatest sights were the Elders themselves: seven Elders to make decisions on behalf of the Freetor people and to preserve and protect the magic that separated us from the Marlenians. But only six Elders were here today. They were suspended in the air on carved stone chairs. Each chair had a high back and was carved to look like an underground animal. Elder Mainchin sat upon the giant earthworm chair. His salt-and-pepper hair grew in patches on his head, but maybe it was just styled that way. Next to him floated Elder Clancy, on the crouching badger chair, and his twin sister, Elder Cleena, on a chair shaped as an alert rabbit sniffing the air to the left. It was said that Elder Cleena had been chosen first to train with the Elders, but she had refused to be apart from her brother. Training to be an Elder was a lifelong commitment, and for half of that time, apprentice Elders were not allowed to speak. It made me think of what I would do if I was chosen to be an Elder. Be away from Rordan most of the time and not be allowed to speak? I didn’t think I’d be able to do that. To the right, Elder Trecia sat on a chair shaped like a fox—I smiled at this. Elder Trecia was younger than the other Elders, in the middle of her child-bearing years. Her face was round but her hands, sticking out from her oversized robe, suggested she had a smaller figure. Elder Garvan, with the groundhog chair, was thinner than a tree branch and looked twice as frail. He wheezed and hacked into his hand and breathed heavily through his mouth. The chair at the end was empty and featured an oversized ant rearing on its back two legs. I stifled a laugh. Elder Raibeart was supposed to sit there. Perhaps he was busy training the younger Elders. The centremost chair, and also the highest floating, was a large spider. It was the seat of the Great Elder Erskina, the oldest and the most powerful person in all of the underground. The stone arachnid’s legs wrapped around her frail body in a tight embrace, as if they were the only thing holding her there. Erskina looked as old as the stone in the walls, but she was nowhere near as smooth. Wrinkles lined every part of her face like the tracks that worms made in the dirt. I knew that some of the lines were scars from when she used to battle Marlenians on the surface. It was said that she could pick out a disloyal Freetor with a look and kill a Marlenian by blinking. She laced her fingers, reminding me more and more of a black widow crushing its prey as her dark, beady eyes evaluated my presence. Her voice bounced off the cavern walls. It was gravelly but melodic. The two guards in front of us bowed. I was a little shocked to see Rordan bow too. I didn’t know we bowed to the Elders. Then again, I had never been summoned by them before. I hastily followed suit. We did. The Fighters parted to each side of Rordan and I. “We brought her,” said the first. There was a moment of silence. Not knowing if I was supposed to introduce myself, I stepped forward and forced a meek smile. “You are Kiera Driscoll?” Erskina asked. “She’s not old enough yet, Erskina,” said Elder Trecia. I tried to hide my grimace. Erskina raised a skeletal hand to silence Elder Mainchin. I glanced at Rordan. He was staring at his feet. I knew he disapproved. “What did they take?” I asked. Erskina breathed deeply, looking up at the top of the cave. A faint blue light wafted in and drifted down the walls. She followed it with her eyes. As if by some secret order, the two Fighters left the cavern. The door banged shut behind them, echoing throughout the space. “The knowledge of the ancients,” she said quietly. “Or, if you will, the origins of Freetor magic. When Alastar Allayway led our exiled ancestors to the underground, he vowed that the surface folk would never learn the secrets of our power.” She rubbed her forefinger and her thumb together daintily, producing tiny sparks of green light. “But he did want to ensure it was preserved among us. He wrote down his knowledge in a tome in a code that has now become common for the Freetors to interpret. “Upon his death and the creation of the Council of Elders, it was determined that one of our sacred duties would be to protect Alastar’s Tome, as it is what every newly chosen Elder learns from in the Temple of the Elders.” She gestured to her right to a cavern blocked by a thick tapestry, where the young Elders in training mastered the secret Freetor magic in silence. “Alastar’s Tome is more sacred, more valuable than the life of any one Freetor. My throat tightened. Every Freetor alive today owed their lives to the Elders—it was their magic that kept the Marlenians afraid of us, and it was their magic that protected us from any large-scale attack. If the Marlenians deciphered the secret to the Elders’ power, we would lose our only advantage. I was so angry I couldn’t speak. All this time, I had been trying to make a difference on the surface, to help our people, and then to be stabbed in the back by one of our own? The folktales said that each Freetor had a drop of magic in his or her blood, and because the Holy One snubbed Alastar’s offer almost two hundred years ago, the Marlenians were cursed to always want but never have the magic. Magic was dangerous in the wrong hands, and that was why only those selected to be trained as Elders were allowed to know its secrets. “If you have special bonds to the knowledge, why didn’t you know it was being stolen?” I asked. “Someone like . . . the Holy One?” I guessed. I’d always suspected that he knew more about Freetor magic than he should. The sceptre he carried had been kept in the mountain-embedded Cathedral of Dashiell long before the Tramore family reigned Western Marlenia—it was said that when Captain Tramore held it high above his troops, it was as if Dashiell spoke through him, inspiring the men to fight for their lands. That was the day we lost ours. I couldn’t help but grin. This was the most important assignment in possibly all of Freetor history, and she was giving it to me. My gallivanting around the Marlenian streets in a violet cape had paid off. It took every ounce of willpower not to jump up and down with glee. Anything to accept the task. “Excellent. 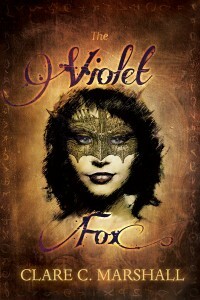 I hope this won’t be a challenge for you, Violet Fox,” Erskina said with a hint of amusement in her voice. I bowed my head and smiled. This would be easy. Even a blind man could spot Freetor magic—if he was a Freetor. “When do we leave?” Rordan asked. I hid my disappointment and nodded. So I was trapped underground, for now. A good trade-off though, for how much time I would be spending on the surface. She waved her hand, and the doors behind us creaked open. Rordan and I bowed once more and left the Central Cavern. The Fighters escorted us to where the smooth-stone walls and Elder tapestries met the dirt-rock walls splattered with glow moss and then left to deal with other business. From there, we made our way towards our home cavern. I bounced most of the way. Rordan snorted. I stopped bouncing. “What’s the matter with you? Jealous?” I taunted. Intrigued? Want to know more? Get your own copy!